Travelling in an RV called "Blue Snoopy"
Those who have visited this site in the past may now notice a change in the title name from “Travelling in a motorhome called “Blue Snoopy”” to “Travelling in an RV called Blue Snoopy”. If you don’t want to read any further, the reason for the change in name is that we have now have a caravan. Recently, we had considered stopping travelling in an RV, however, our passion for the lifestyle and for continuing to travel in Australia has seen us trade our caravan for a smaller unit. We also have a large number of friends who enjoy this lifestyle. We know that there is a perceived difference between the Campervan / Motorhome society and those travelling in caravans but at the end of the day, does it really matter as we are all out there doing the same thing? We are all travelling in RV’s and that is what matters. We believe that in Australia a recreational vehicle (RV) is any vehicle, whether towed or driven that has a kitchen, bathroom, bedroom and living area. Recreational vehicles include motorhomes (class A, B, and C), fifth wheelers, campervans, caravans and slide-on campers. Several years ago, the Australian Caravan Club, which we are proud members of, changed its constitution to allow for all types of RV owners to become full members with equal standing. It is disappointing that a vote by members at the 2017 AGM of the CMCA (representing motorhomes & campervans) failed to achieve the required number of votes for that organisation to change its constitution to give equal rights to caravan owners. That change could have resulted in a very large body working for all Rvers. That decision also resulted in our resignation from that organisation. So why are we now travelling in a caravan and not in a motorhome as we first started? Whilst there were some minor economic reasons for making the change, there were parts of Australia that we could not see due to the inability of being able to take the Winnebago or the Sunliner over difficult road surfaces. In saying this we are not at all suggesting that the Winnebago or Sunliner were not capable of travelling on dirt or gravel roads, that is very far from the truth. We took the Winnebago down the Darling River run from Bourke to Wilcannia and the Winnebago RV Club conducts a safari every couple of years to Birdsville. Both of these destinations require extensive travel away from the “black stuff”. Winnebago motorhomes stand up to these trips without any issues. The Sunliner spent time on the dirt roads to the east of Coober Pedy without any apparent problems. Some examples of areas that we were not able to get to were the Painted Desert in SA, areas of the Flinders Ranges where 4×4 (with reasonable height clearance) was required and several destinations around Alice Springs. The car and caravan combination gave us the ability to visit these places. We must acknowledge that the motorhome gave us flexibility associated with a motor home (it is great being able to get up from the front and walk into the back without getting wet) and we know that it takes longer to establish a camp site due to the additional setup that the caravan requires. This site is about the travels of an RV called “Blue Snoopy”, now a 2018 Adria Altea 402PH Sports caravan towed by a 2012 Nissan Navara ST D40 4×4 utility. This replaced the Nissan / Nova combination that we purchased from our friends at Sydney RV at Penrith NSW on 31st August 2012. Previously we have travelled in a motorhome, a Winnebago Leisure Seeker 2334SL Motorhome on an Iveco 50c18 truck body and chassis. The vehicle was constructed in March 2008 by Winnebago Industries in the outer Sydney (NSW Australia) suburb of Emu Plains and purchased new by us from The Sydney RV Centre at Narrabeen NSW in August 2008. For those who do not know, Winnebago IS an Australian company with its roots dating back to 1965 when Bruce Binns and his wife Ruth introduced the first slide on camper to Australia. That motorhome was the second motorhome we owned with the first also carrying the “Blue Snoopy” name. Our first motorhome was a Sunliner Odyssey on an Iveco 50c17 truck body and chassis. This site also contains selected photographs from our trips in “Blue Snoopy” (within Australia) and from other trips where we travel in alternative (ouch!) transport. Given time, we will continue to endeavour to provide information via our blog for other travellers as the only way we have learned is by firsthand knowledge or by word of mouth. When we consider it appropriate, we will continue to post comments relating to caravan parks, roadhouses or camp sites that we stay at. We have found this sort of information from other travellers invaluable in the past. Let’s face it, there is a lot of content on the internet that provides misleading information about accommodation. Since we have commenced our travels in an RV within Australia, the Internet has provided us with an enormous amount of information and now we intend to share our experiences in the hope that others may benefit from our experiences and mistakes. We also believe and recommend that all travellers using any type of RV become members of the Australian Caravan Club. We have found it very difficult to locate a single source of information for new RV travellers and hopefully we can do something towards assisting in this area. It is amazing how much information is available on this (RV) subject but how difficult it is to find the answer to a question. We are still learning something different every trip we have. Australia is an amazing place and beckons one to closely study its wonderful features and the places you hear about both in songs or recall from geography classes at school. Slim Dusty sang about “The School of Arts Hotel”, John Williamson sings about “the Diamantina River”, “Cootamundra Wattle” and not to forget “The Rock (Uluru)” and you see Paul Hogan on the silver screen at the “Walkabout Creek Hotel”. These are all real places that we have visited! And then there is Coober Pedy, a dusty town in the centre of South Australia that we fell in love with! Each time we return there, the magic still remains. Broken Hill is also a very special place we have visited several times. Until June 2006, we had no real idea what a motor home was other than what was shown in American television programs. After looking at a motorhome at a travel show, the question was presented to “She” about the possibility of camping in this manner. “She”, who had never been camping before said “yes“ and reasoned that the motor home had a door that could be locked, a reasonable size bed and most importantly, a toilet. Then the biggest surprise of the day came with the price of the vehicle and the cost to insure. We certainly could do this! The first motorhome carrying the name of “Blue Snoopy” was delivered to us in early November 2006 and from that point in time onwards, our lives changed. We have to thank Ron Warden, Anthony McCosker and Bert Van Leeuwarden, who are all from Australian Motor Homes at Bennett Green, Newcastle, for helping us to travel in the direction that we have taken. We also have to say thanks to a work colleague who gave us tickets for the luxury holiday show where we saw the motorhome. Actually, the main reason we attended the show was that parking was included with the tickets. On 08/08/08, our Sunliner Odyssey “Blue Snoopy” was traded for a new Winnebago Leisure Seeker 2334 SL. The new motorhome also bears the “Blue Snoopy” name and the travels of this new machine will continue to be documented through this site. You ask “why get rid of the Sunliner Odyssey”? When we acquired the Sunliner, we were embarking into unknown territory as “She” had never been camping before and the Sunliner provided both a toilet and a locked door. At the time, the price was right for our budget and the design more than suited our perceived requirements. After almost 2 years, 2 major trips into the centre of Australia and close to 26,000 kilometres on the speedo, it became VERY apparent that the Sunliner was not providing the amount of room we needed for a lengthy trip in a country where the weather conditions are so diverse and sometimes, unpredictable. This was highlighted in June 2008 in the Flinders Ranges when, due to rain and then mud, we spent a fair amount of time inside the motorhome and the lack of space became very evident. Also, we both decided it would be nice to have a separate shower and toilet rather than the combined shower / toilet unit in the Sunliner. We always believed that the Sunliner Odyssey would only be a short term proposition but neither of us anticipated an exchange of vehicles within 2 years. Yes, we have fallen in love with the lifestyle and the new “Blue Snoopy” will allow us to enjoy it “to the Max” for many years to come. 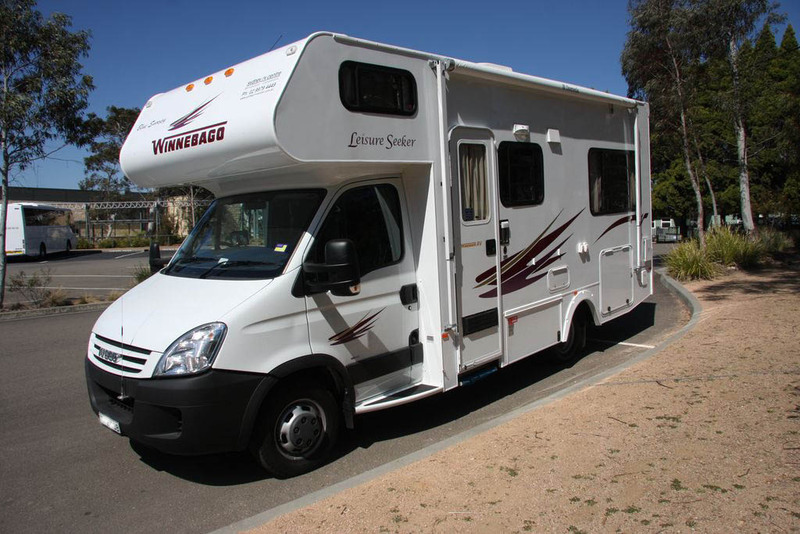 On 31/08/12, our Winnebago Leisure Seeker “Blue Snoopy” was traded for a new 2012 built Nova Vita caravan and 2012 Nissan Narava ST Dual Cab 4×4 utility tow vehicle. The caravan was also given the “Blue Snoopy” name and the travels of this new machine were also documented through this site. Over the months prior to August 2012, we had looked at several caravans with the intention of swapping both the motorhome and our car for a new tow vehicle and caravan. We decided that we must have a caravan with tandem wheels and that put us into the 19 foot caravan bracket. “She” also wanted a caravan with a washing machine and whilst we knew we would be going to an RV that only sleeps two persons, we accepted that limitation. A separate shower / toilet was also a mandatory requirement. The “third” and current Blue Snoopy. Without naming brands, we looked at caravans offered for sale through Central Coast and Newcastle dealerships before heading off to Sydney RV at Penrith. Initially we did not fall in love with the Nova (when we first visited then we actually didn’t look at the one we ultimately purchased) and left Sydney RV after asking Phil Rorke to see how they could cater for what we were after. Several days later Phil called us with an offer that saw us heading back to Penrith on the following weekend. The rest is now history, the caravan that was suggested to us ticked all of the boxes and “She” was more than happy with the colour combinations. Additionally, the suggested Nissan Navara appeared to be more than a suitable vehicle for the task ahead. We signed up on the spot. The base package included the towbar, an anderson plug (to power the caravan whilst mobile) and an electronic brake controller. An AL-KO ESC stability control system was added to the caravan since the initial purchase. 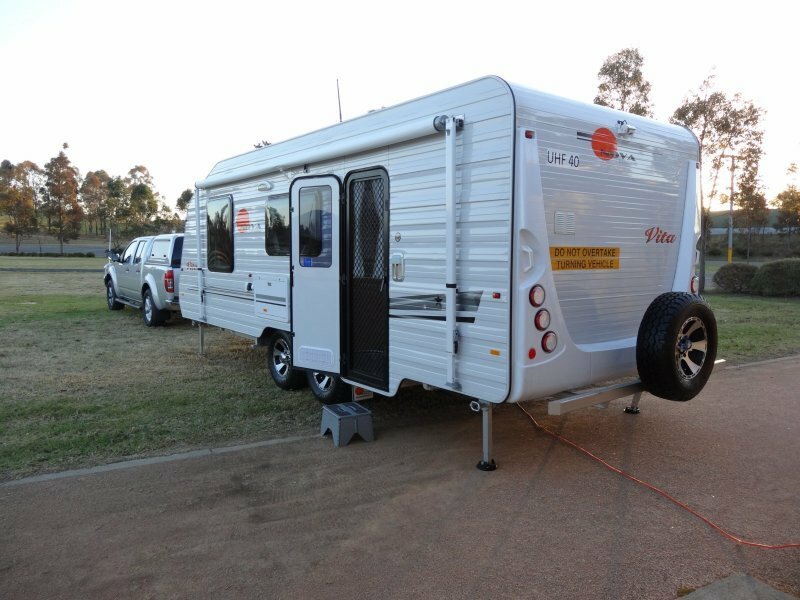 We have had a few teething problems with the caravan that were resolved over time and the attention given to us by Norman Roe (Sydney RV Centre Penrith), Robert Cataldo (the owner of Nova Caravans) and Paul Golding (Nova Caravans) was second to none. 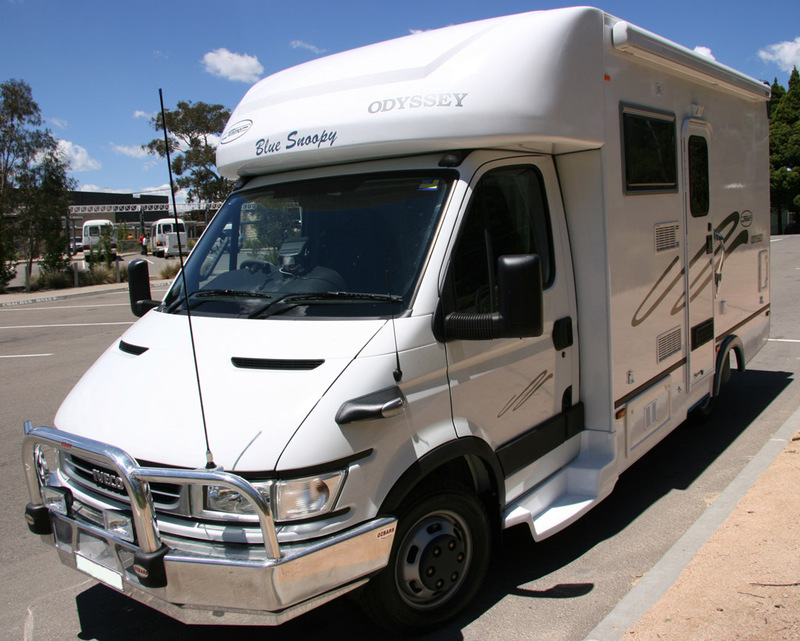 We have no hesitation in recommending Sydney RV Centre if you want to purchase a Nova caravan. We also recommend that you look at the Nova product if you are in the market for a new caravan. You might like what you see! 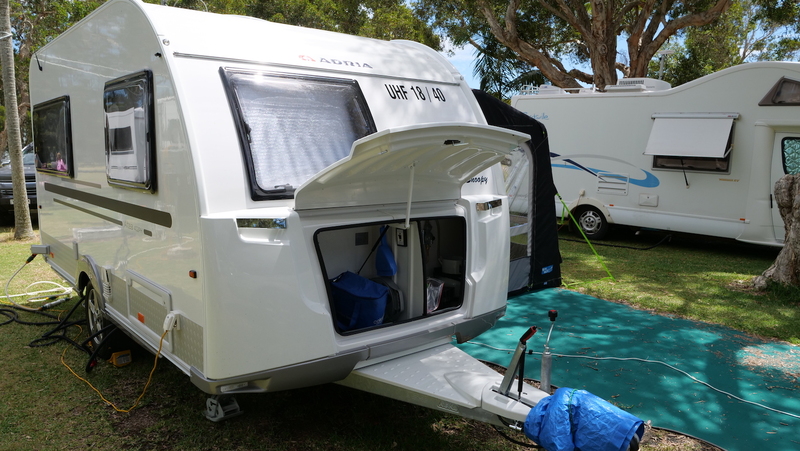 We placed an order for an Adria caravan after returning from Western Australia in June and at that time, the expected delivery date was either late August or early September. As the days went by, the delivery time started to blow out with Sydney RV eventually giving us a landed date in Australia of 28 October. That date never happened with the caravan arriving on or about 5thNovember. When that date was advised to us, we immediately booked the delivery for 20 November which gave the dealer time to have the caravan ready for us. The caravan was built in Europe in the small country of Slovenia. The manufacturer, Adria, is one of the larger manufacturers of RV’s in the world. Our caravan was shipped to Australia in a container with small wheels. Once the caravan arrived at the dealer, the wheels were replaced with 16” rims and tyres, the awning was added as was the television antenna. Two gas bottles and the AGM battery were also added after the caravan arrived. We asked for a solar panel to be added as well as a reversing camera. The model that we purchased is supposed to have been fine tuned for the Australian conditions (16” wheels and some other mods). It carries a badge that states that the caravan was made for “Australia and New Zealand”. Apollo Motorhomes is the Australian agent for Adria, Apollo Motorhome, at the time of writing, is the owner of the Sydney RV Group. Back in the early 1970’s, “He” purchased his first car, a blue mini that had “done time” before being retired from “The (Police) Force”. At the same time, Charles Schulz’s “Peanuts” was the flavour of the month and a toy of one of the characters, Snoopy, found its way into the mini and rested on the rear parcel shelf. The combination of the two items resulted in the mini being called “Blue Snoopy”. Unfortunately the first Blue Snoopy came to grief on the road into Wombeyan Caves when it was retired following an accident on a blind corner. When we purchased our first motorhome and decided that it needed a name it took very little time to decide to carry the “Blue Snoopy” name forward. It rested on the Sunliner Odyssey for almost 2 years until “He” and “She” decided that the Odyssey was a fraction small for their future needs and the requirement of having additional space and a separate toilet and shower resulted in the acquisition of a larger motorhome. “Blue Snoopy” then spent almost another 4 years as the name given to our Winnebago Leisure Seeker. “Blue Snoopy” now travels onwards on a Adria Altea 402PH Sports caravan pulled by a dual cab Nissan Narava utility!